Many U.S.-based hospital Group Purchasing Organizations announced a number of years ago that they would require the use of GLN and GTIN by December 2010 and 2012 respectively. Apparently at least one of those GPO’s also requires the use of GDSN but without specifying a date. 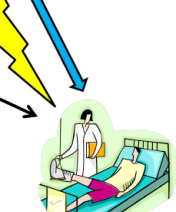 Here is my rendition of GDSN use in healthcare. I show it as a cloud-based repository where the manufacturer publishes their product master data and where downstream trading partners can subscribe to it. That way everyone in the supply chain—right down to the healthcare professionals at the points of care—are using the exact master data as published by the manufacturer. Admittedly this rendition doesn’t show how GDSN is implemented, but I happen to think that’s less important that showing what it is. See GS1 for the details. Up to this point in time there still hasn’t been any significant use of GDSN in the U.S. medical supplies and devices supply chain and it is tough to get an entire industry to adopt something so large without some kind of incentive. The GPO’s are trying to provide that incentive by mandating its use, so at some time after the GTIN is widely adopted on medical supplies and devices, SCMD may be synchronized between manufacturers and hospitals, and perhaps distributors as well. 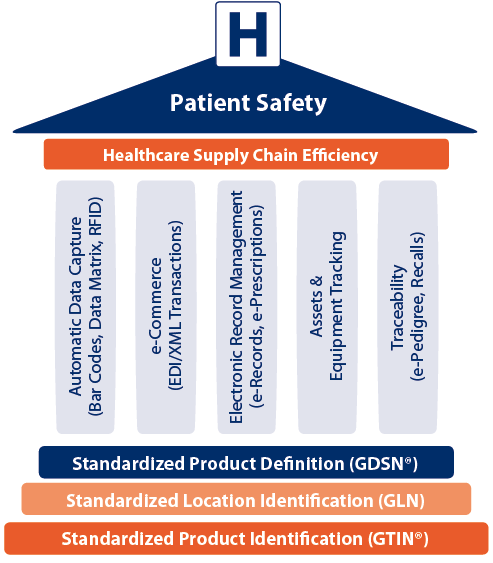 GDSN is also not currently used in the U.S. pharmaceutical supply chain, but in my view, it will be a necessity if/when GS1’s EPCIS standard is ever used for track and trace applications like ePedigree. In my view, EPCIS alone can’t be used for compliance with the existing pedigree regulations in the U.S. (see my essays, “Why GS1 EPCIS Alone Won’t Work For California Pedigree, Part 1” and “…Part 2”). But EPCIS just might become the basis for the track & trace standard that the FDA will publish by the end of this year (see me essay “InBrief: FDA To Publish Track & Trace Standard By Year End”). Many people believe that standard will be based on EPCIS, similar to the way FDA aligned their sNDC standard with GS1’s GTIN (see my essay “FDA Aligns with GS1 SGTIN For SNDC”). Include me in that group. But, by design, EPCIS events do not carry SCMD (see my essay, “Pedigree Models and Supply Chain Master Data”), so if EPCIS events form the basis of an ePedigree, it will be a absolute necessity that all parties who are consuming and updating those pedigrees use the identical product class-level master data. That would be necessary because everyone would need to agree on exactly what constitutes the drug that is referenced by the GTINs in the EPCIS events. Without that common agreement on exactly what the GTINs mean, how can there be a true pedigree? 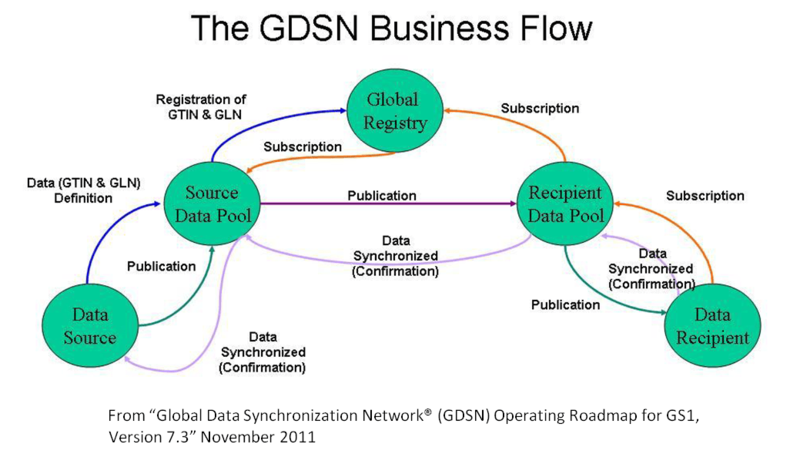 Here is a drawing that shows how GDSN could be used in conjunction with a semi-centralized ePedigree system that is built on top of EPCIS events. 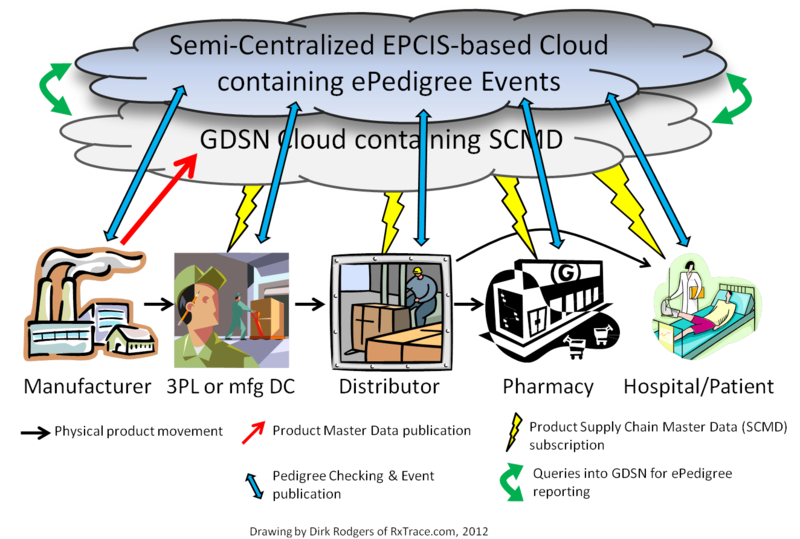 Notice how each trading partner in the supply chain communicates with both the GDSN cloud and the Semi-Centralized ePedigree cloud. In actual implementation these clouds might not be so distinct because the same vendors might offer both, but I show them separate here because they are serving distinctly different purposes. 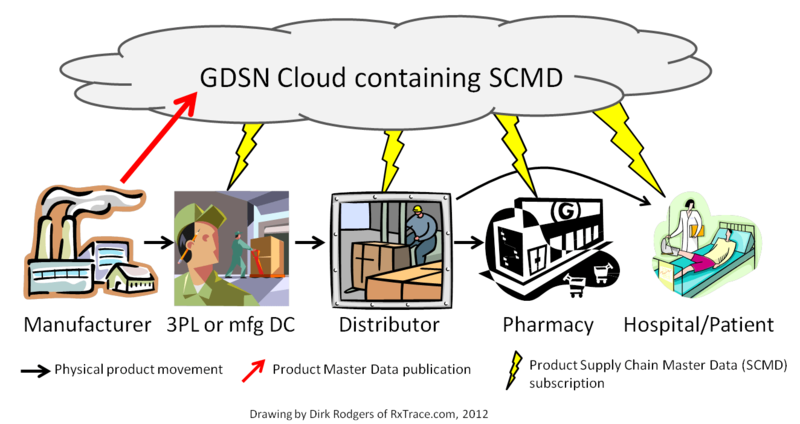 The GDSN cloud is serving as the common source of product SCMD as published by the manufacturer—keyed off of the GTIN—and the Semi-Centralized ePedigree cloud, based on EPCIS, is serving as the common repository for all supply chain events that occur to the actual unit-level instances of those products—keyed off of the serialized GTIN, or SGTIN. The clouds also communicate with each other because, to produce a usable ePedigree report the ePedigree engine would need to obtain the SCMD from the GDSN cloud. As I said, I think something like this will be a necessity if EPCIS is used as the basis of an ePedigree system. So far when people in the industry talk about using EPICS for ePedigree they almost always forget the SCMD. The ePedigree solution I show in the figure above is a very efficient model since the SCMD does not travel along the same path as the instance data (the EPCIS events). This is in stark contrast to DPMS which needs to carry that data along with each ePedigree document—a big negative for that standard that many have pointed out over the years. All pedigree models have trade-offs. One of the trade-offs of ePedigree models based on EPCIS is that GDSN will probably have to be adopted throughout the U.S. pharma supply chain over a fairly short period of time, but no doubt patients would benefit greatly from that. There you have it. Not only would pharma trading partners need to adopt GLN and GTIN, in this scenario they would also need to adopt EPCIS and GDSN shortly afterward. In the pharma supply chain you can’t use just one! Can you see any alternatives to this scenario besides adding DPMS in some way? Leave a comment below. Thanks, again for another well-crafted post. Might be interesting for your followers to include some secondary sources. Examples: There is a lot going on in Congress on Pedigree. Some analysis is published, but not aggregated in a way that is meaningful for industry. HDMA has recently reported for their Members on Pedigree. I’m not a Member and don’t have a copy. Some GS-1 companies are Members. Then there are items which GS-1 could supply. Example: I’ve asked GS-1 for the real regulatory requirements abroad…. No answer. I believe AIDC is key to modernizing healthcare. Also believe that a well informed industry can better help reduce healthcare costs. Disclosure: I have patents in mobile electronic medication management. AIDC can be an enabler for telemedicine. I’m still on the HIBCC BoD. Do you think it’s a coincidence that the counterfeit Avastin came from Turkey? Is it because they need to find a place to sell the counterfeits since Turkey has required serialization/authentication? Looks like the US is falling behind in protecting consumers. Thanks for the compliment and the qutseions.In order, I’m not a nurse. I have a lot of experience with computers in healthcare and now barcodes.Hospitals haven’t adopted barcodes because . . . well, barcodes have a awful reputation in hospitals. The abundant use of the linear (or 1D barcode ) which is most often seen at your check-out line at the supermarket, is the primary cause of this reputation, IMO. Since hospitals aren’t running frozen patients and’ their barcodes down a conveyer belt to be read under a fixed scanner, there are far more problems reading linear barcodes than most people expect.2D barcodes don’t have the same scanning problems as linear barcodes, because you snap a picture of them and decode them, rather than scan them. THey also store a lot more information.We’ve blogged on these topics a fair amount, so please do look through the archives and you will find detailed answers.